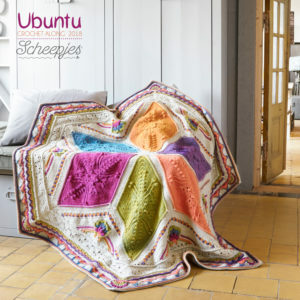 I am sure you all have plenty of scrap yarn lying around. I certainly do! 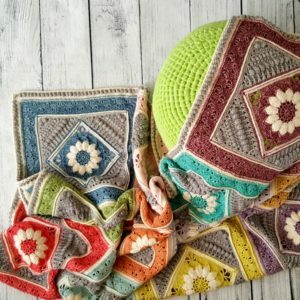 So today I want to talk about using your scrap yarn (and, let’s face it, making space so you can buy more yarn)! 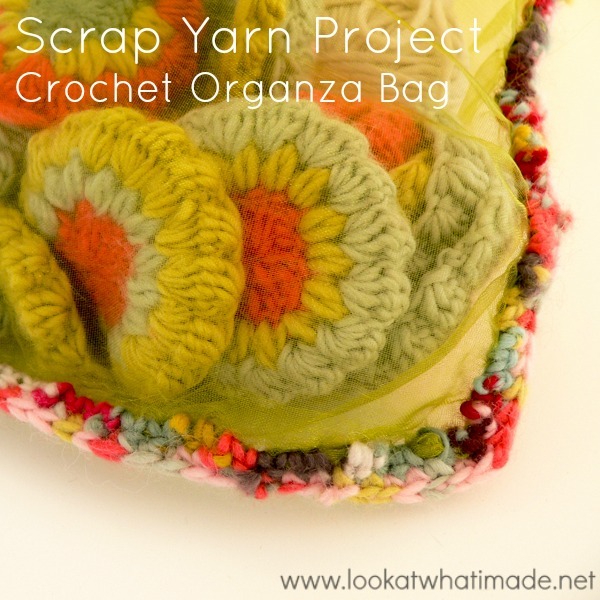 I am also sharing a quick scrap-buster project in the shape of a crochet organza bag (or an ‘organza bag with a scrap yarn edging made from a magic ball’, but that’s waaayy too long for a title). 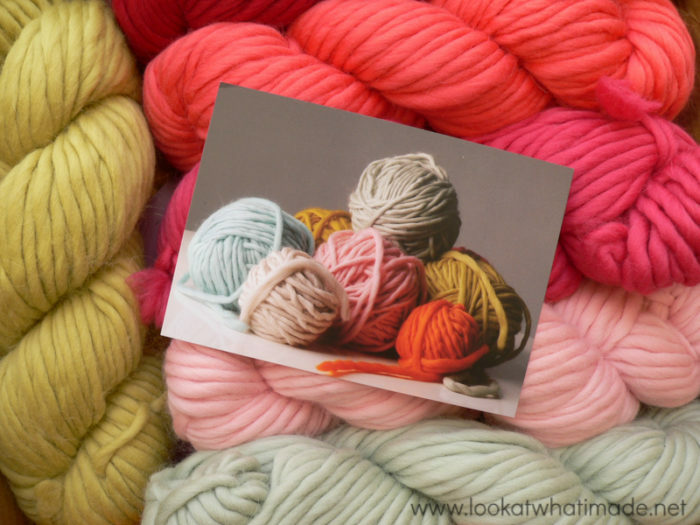 I stole this idea from my friend Lynnette Wilkie, who bought me this gorgeous assortment of Plump yarns for my birthday. 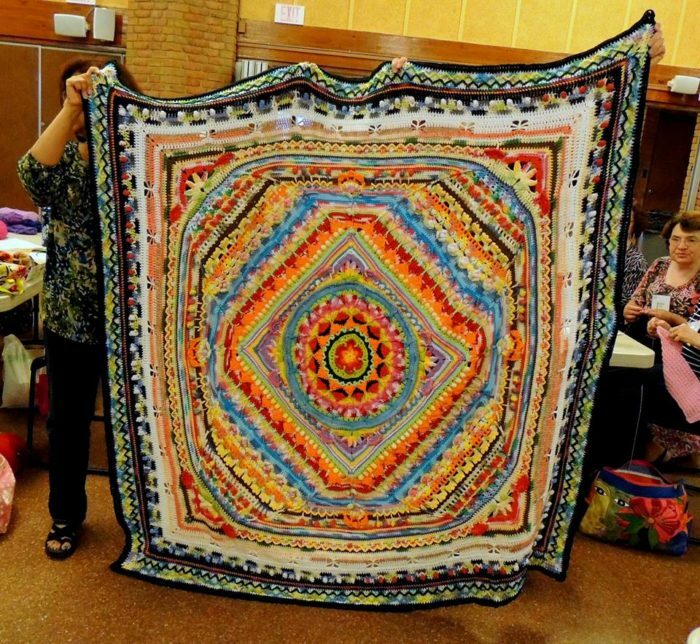 When she came to visit me a few weeks ago, she was working on a Sunburst Granny Blanket made from Plump Dk. When she produced her little Sunbursts (is that even a word? 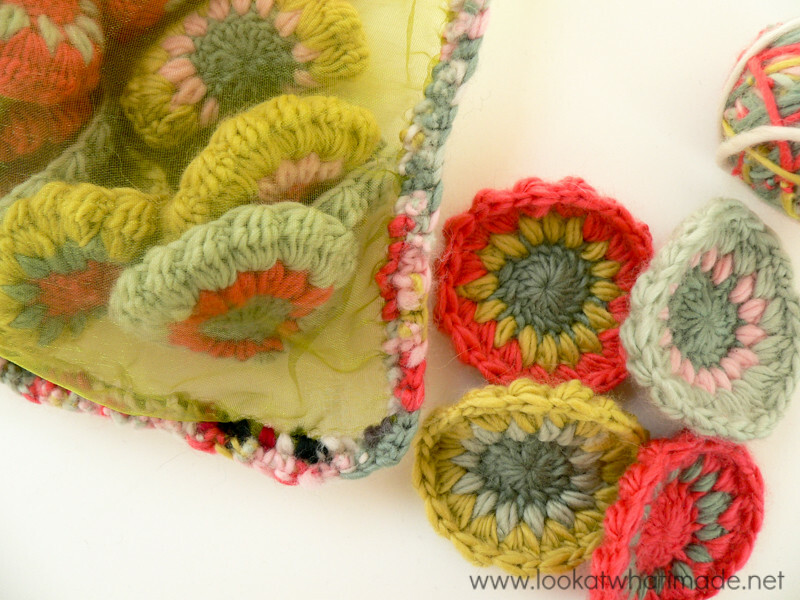 ), they were ‘living’ in a cute organza bag with a single crochet edging. Nosy wee lass that I am, I grabbed the bag from her and proceeded to unpack it. It contained a number of half-made squares and a ball of scrap yarn, made by knotting small lengths of yarn together (often referred to as a ‘magic ball’). When I was little, my granny used to ‘meld’ all the soap-ends together when they got too small to be used on their own. Eventually she would have a cake of soap made solely out of soap-ends. 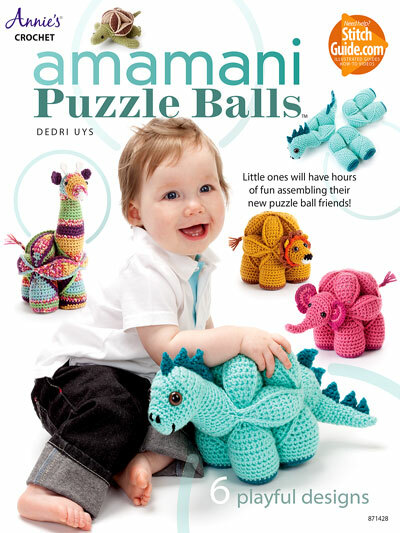 A magic ball is the yarn equivalent of this. By joining your yarns using a magic knot, or the Russian Join, you can make a multicoloured ball of yarn that is perfect for scrap projects. 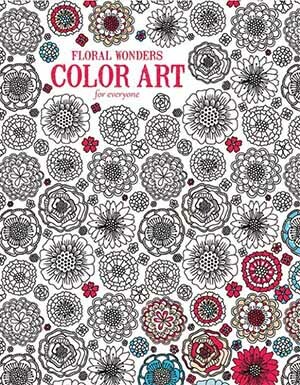 Depending on the lengths of yarn you join, you can get a variegated look or a slow colour change. 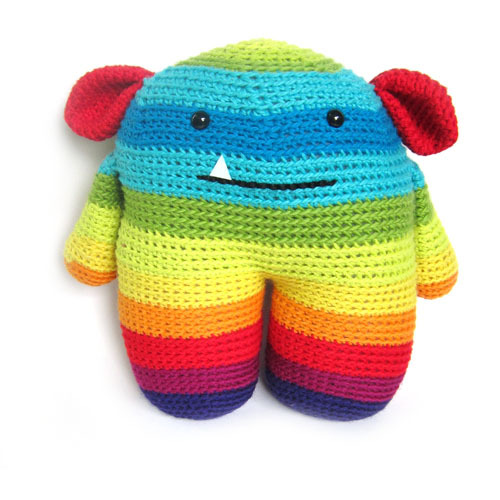 ‘Roy the Rainbow Monster‘ from Fresh Stitches was specifically designed to be made with a slow-change magic ball. 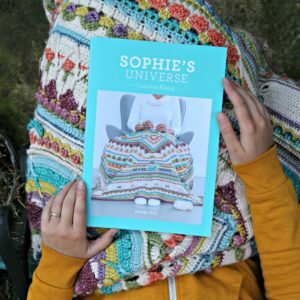 Although this gorgeous rendition of Sophie by Aura Perez was not made using a magic ball, it does show you that scrap yarn projects don’t have to be limited to small items. You can see all Aura’s photos HERE on Ravelry. 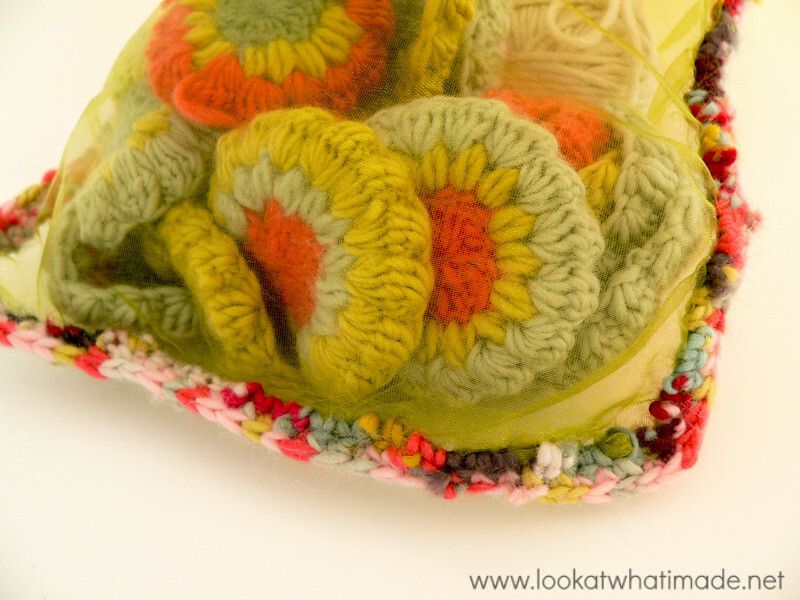 This crochet organza bag is the perfect project for a quick-change magic ball (made by joining all your yarn tails together, for example). It might seem like a silly little project, but I loved looking at the edging on Lynnette’s bag, and this is such a simple (inexpensive) way to make yourself smile. 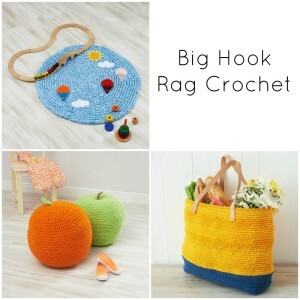 A small crochet hook – a 2.5 mm hook is small enough to be able to pierce the fabric easily, yet big enough to grab hold of a strand of worsted weight yarn. 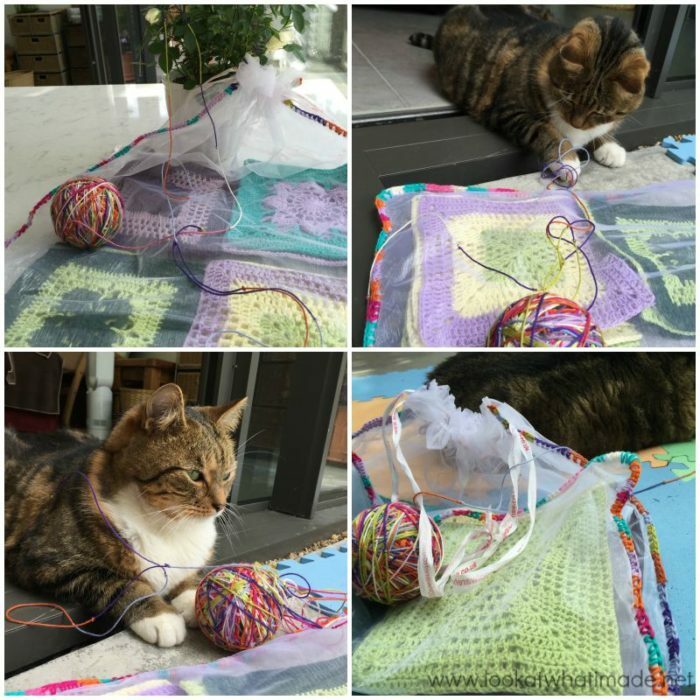 You can crochet directly through your organza bag, provided that you are using a small hook (2.5 mm or below). 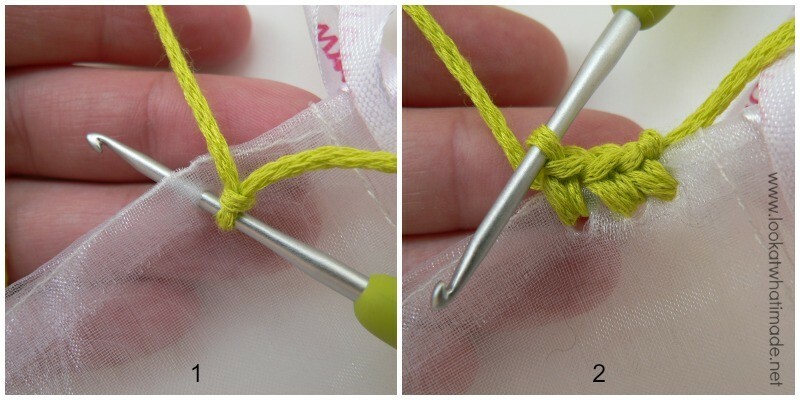 If you would like to create an edge on a linen or cotton bag, you can use these EdgIt Piercing Crochet Hooks to make it easier for you to work through the fabric. Starting with a slip knot already on your hook, poke your hook through both layer of fabric, about 5 mm from the side seam and about 5 mm from the top of the bag*. See Photo 1. 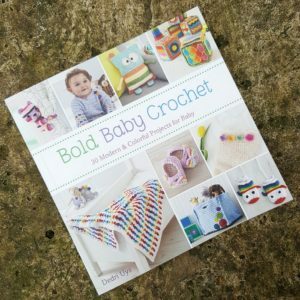 Make a standing single crochet. Single crochet all the way around the 3 closed sides of your bag, spacing your single crochets 5 mm apart (Photo 2). 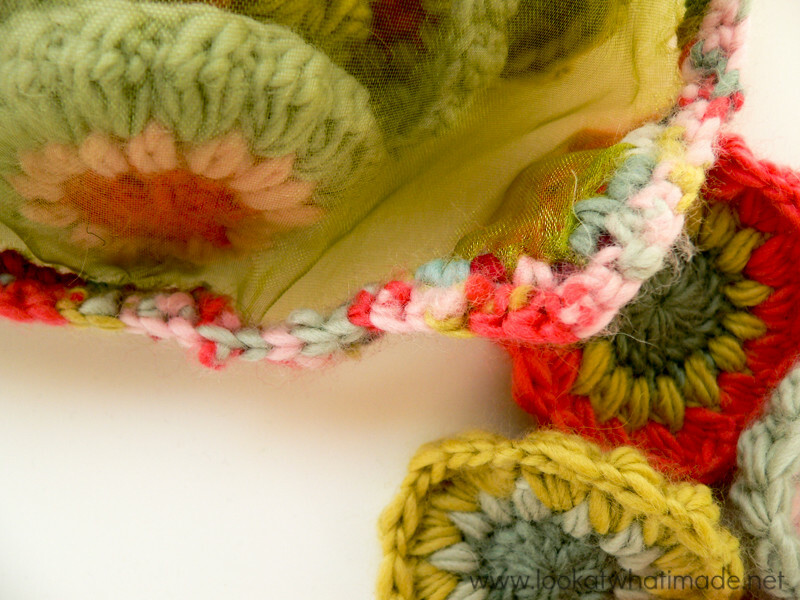 The spacing might be slightly more or less if you are using thicker or thinner yarn than a worsted weight. When you get to the end, ch 1 and turn. 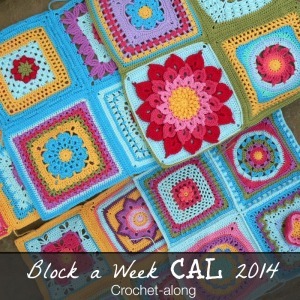 (Make a single crochet in each stitch until you get to the corner. 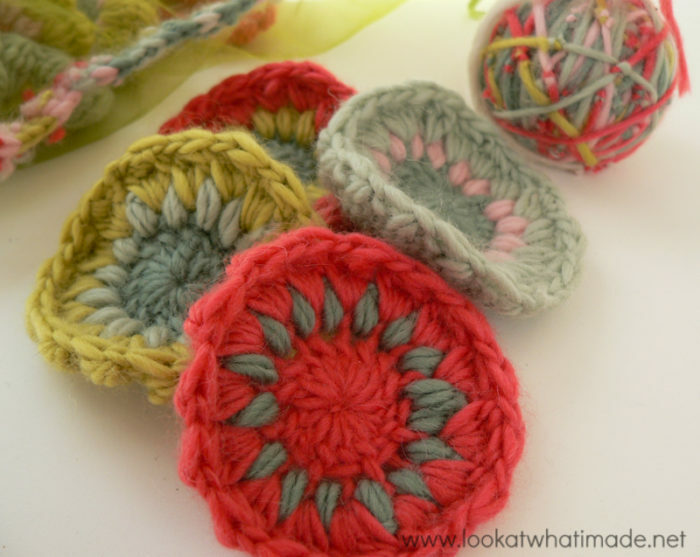 Make 3 single crochets in the corner stitch) twice. Make a single crochet in each stitch until you get to the end. Bind off and work away your tails of yarn. *If you have a drawstring bag, you will have to start and end below the drawstring. 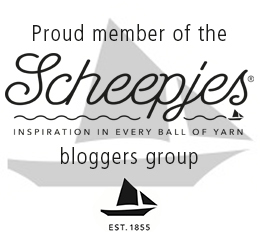 I am using a 2.5 mm Clover Amour crochet hook and Scheepjeswol Bloom to demonstrate. 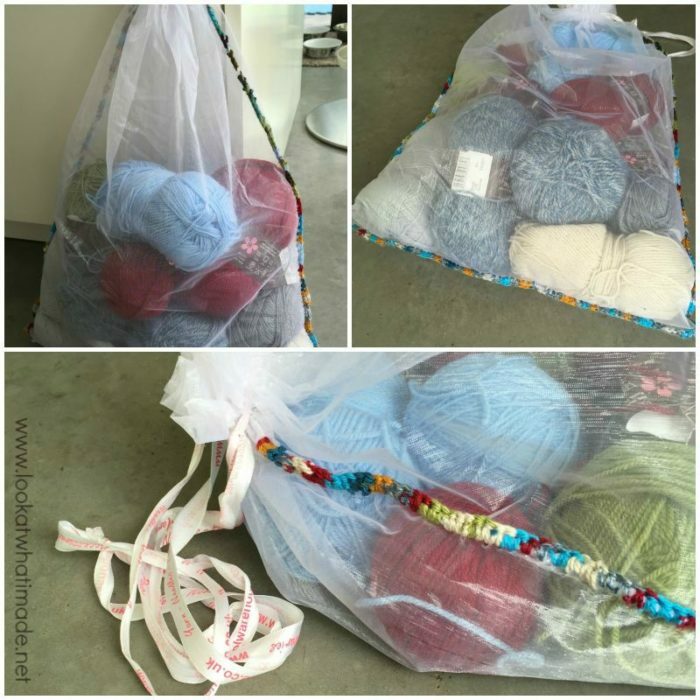 Although I am not usually one for embellishing bags, this is something I will definitely do next time one of my bags rips at the seams (which organza does quite easily). These bags are so handy for carrying my WIP’s to work in. Not only does it keep my yarn and project together, but it also allows me to see what is in the bag without having to tip everything out. And I just love looking at the photos of Lynnette’s bag with it’s pretty mottled edging. Lynnette has kindly sent me some photos of her other crochet organza bags. 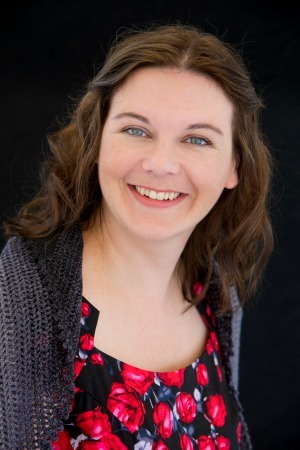 Thank you, Lynnette! 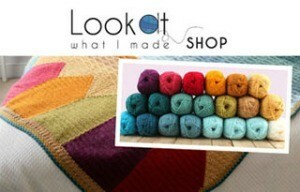 What do you do with your yarn ends? Well, would you believe, I just made a great computer bag from scrap yarn. And because it is really woollen and too warm for summer, the cover is temporarily a pillowcase for my living room. I have a large jar with a lid about 2 gal size…..every time I weave in the ends on a WIP I put a handful of the ends and pieces in the jar…. 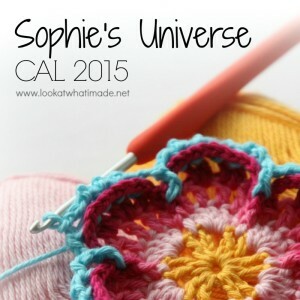 there are layers of many different colors with all the projects I’ve done…. it looks good on the shelf… and I recognize each and every gift finished…. I do like your idea too…. how did you tie the knot so they don’t unravel…I didn’t see the link…. Thanks for ALL your lovely works. How do I make a magic ball? I have not heard of it before. How do you join the ends? Thank you! can you please post the organsa bag s full pic?? 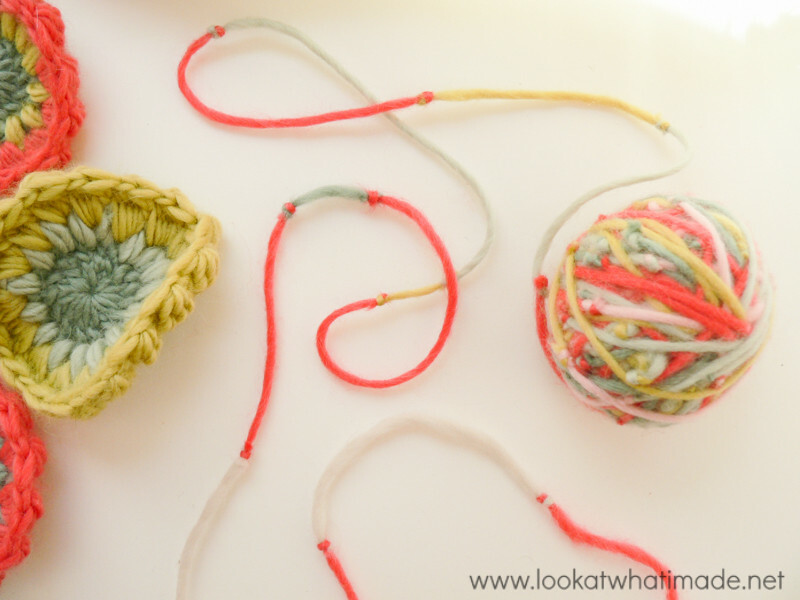 How do you manage to get the pieces of yarn knotted together so neatly? Hi Bridget. There are two links in the post (one for the magic knot and one for the russian join). Both of them make pretty neat joins. That is a lovely idea! I’m in a project bag swap at the moment. So this blogpost came right on time. And love the yarn you got for your birthday. It’s gorgeous.